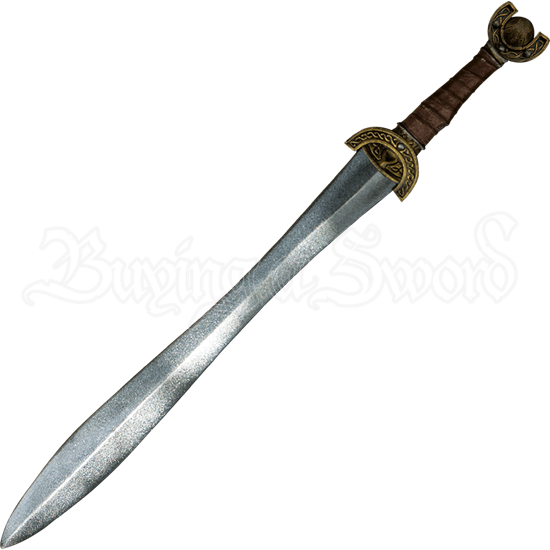 Stand strong on the battlefield with the Celtic Leaf LARP Sword. This medieval inspired LARP sword has a double-edged leaf blade made of high quality, shred resistant foam paired with gorgeous Celtic knotwork accents on the hilt. The blade is narrow at the waist and then swells wider towards the point. Its closed cell foam construction is covered in latex, and its core is made of flexible fiberglass with a protective Kevlar tip. Painted by hand for an authentic, antique brass look, the cast polyurethane hilt is impressively detailed. Twisting knotwork decorates the short, U-shaped crossguard, and the handle has a leather-wrapped look. The pommel mirrors the crossguard in its shape and detail. Whether your LARP persona is Celtic-inspired or you simply appreciate the beauty of its historic form, this latex foam fantasy sword is the perfect blade for all sorts of settings and characters. The Celtic Leaf LARP Sword has an overall length of 33.5 inches. Please be aware that this measurement can vary slightly, as it is a hand-made item. Use Maintenance Silicone to ensure long weapon life and durability.